Surgical and Medical Practices: D.Ç., M.A., M.A., E.Ç., Concept: D.Ç., Design: D.Ç., M.A., Data Collection or Processing: D.Ç., M.A., Analysis or Interpretation: D.Ç., M.A., Literature Search: D.Ç., Writing: D.Ç. 1. D’Hooghe TM, Hill JA. Endometriosis. In: Berek SJ, Adashi EY, Hillard PA, eds. Novak’s Gynecology, 12th ed. Baltimore: Williams&Wilkins;1996;887-915. 2. Bergqvist A. Extragenital endometriosis. Eur J Surg 1992;158:7-12. 3. Tarım E, Bağış T, Tarım A, Kıllıcıdağ EB, Noyan T, Kayaselçuk F. İnguinal endometriozis: bir olgu sunumu. Türkiye Klinikleri J Gynecol Obst 2002;12:184-185. 4. Dwivedi AJ, Agrawal SN, Silva YJ. Abdominal wall endometriomas. Dig Dis Sci 2002;47:456-461. 5. Blanco RG, Parithivel VS, Shah AK, Gumbs MA, Schein M, Gerst PH. Abdominal wall endometriomas. Am J Surg 2003;185:596-598. 6. Kaushik R, Gulati A. Inguinal endometriosis: A case report. J Cytol 2008;25:73-75. 7. 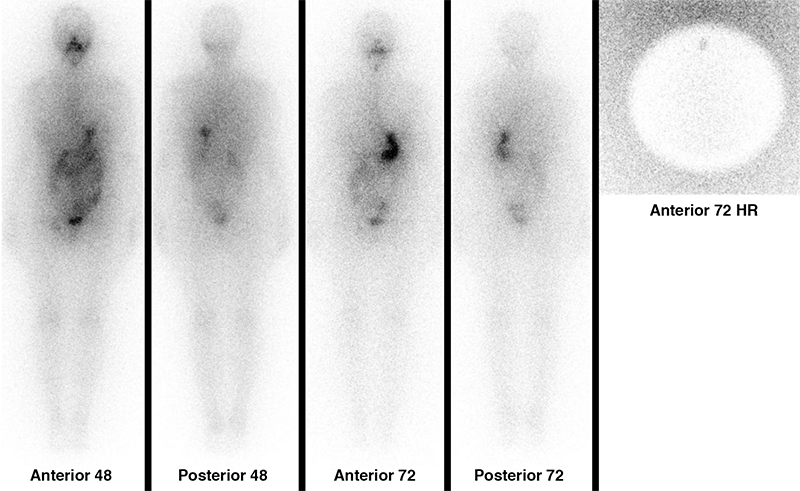 Garger YB, Winfeld M, Friedman K, Blum M. In thyroidectomized thyroid cancer patients, false-positive I-131 whole body scans are often caused by inflammation rather than thyroid cancer. J Investig Med High Impact Case Rep 2016;4:2324709616633715. 8. Hannoush ZC, Palacios JD, Kuker RA, Casula S. False Positive Findings on I-131 WBS and SPECT/CT in Patients with History of Thyroid Cancer: Case Series. Case Rep Endocrinol 2017;2017:8568347.